BLOGGING Blogging or Youtube: Which gets more money? Blogging or Youtube: Which gets more money? Hello Friends How can you tell me in today's post that blogging or youtube is the best and you can make more money. Friends understand that today's topic will prove to be very useful and logical for you people because many people ask me if the blog is best for online income or youtube. And some people have said that in blogging, you can make more money from blogging or youtube, then in this, I understand that this post will help many people and they will be able to get a lot of help. Friends, it is very important to talk on this topic because if you are putting your time in something then it should not be ruined. I hope that you will get a lot of help by reading this post of today and you request the people to read the entire post of this post so that you can get complete information. So guys do not take much time to start this post today. In today's time, everybody wants to earn internet or online money and there are many people who want to make a career on the internet so that they can get a free life and Happy Life. 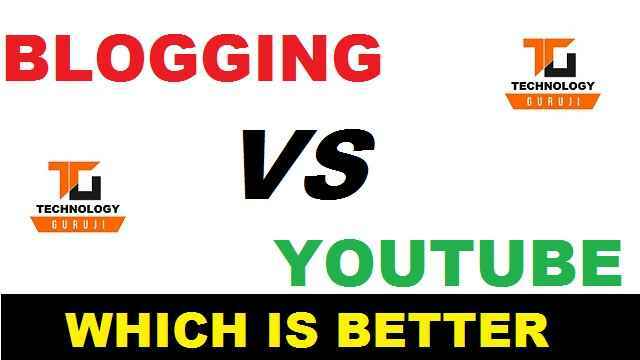 There is no duality in the blog and youtube internet is the best option for earning money and both of the platforms in India today do not know how many people are losing money online and some have either become full-time blogger Or even full-time youtuber and millions of internet. Friends, if you want to earn money by working in blogging or youtube on the internet and want to make a career So in the first place, I will tell you that it is very necessary to think and act according to your thinking and have to work smartly. Because it is very important to get proper guidance in the start of the career because you can not waste your precious time and it is very important to take the right decision at the beginning of your career so that you do not regret later. Now friends talk points and come to the main point of the blogging vs youtube What is the best money to earn and what's more money? Friends, here's a very important thing I'll tell you that both are right in their place, like writing some people and making someone video In both ways, a lot of people are losing too much money and some people have been less than lakhs and have made this full-time career too, and sitting at home is saving good money. Friends, here is the truth in which you share the same with the people in your blog and will always be there. I will not tell you that blogging is the best and can make more money on this because I am blogging myself. I have always cooperated with the truth and here I will say that whatever you are interested in doing, choose that only because if you like to do blogging then you must do blogging and if you like to make a video then you can work on youtube. This total depicts your passion that what you feel more comfortable doing. Because my manna is that if you do any work only to earn money, then you will get bored very soon with that work, and perhaps you will be able to do that work very much in the future. I have seen many people who only come to YouTube or blogging to earn money and in the end, I can say with the claim that most people quit before getting success. Friends, there is nothing more than Passion, if you reduce it, if you feel your whole mind, then you guarantee that you will get 100% of the marks because if you reduce it, in which you do not have money to rot Your work and hard work and determination will also help you to follow the money. Friends have some advantages and disadvantages of blogging. You can also see exactly what you do on YouTube. In blogging, it is very important to have a technical knowledge such as SEO, theme changes work, domain name, web hosting, solving technical errors, etc. Youtube's policy is very strong and if you ever violate the YouTube Community Guide Lines, your YouTube channel also suspends or closes. Youtube can only reduce money from google adsense and you can increase your income with the help of many other advertisements in blogging. If you do your job perfectly, then the money will follow you and the friends say it is not the one who says that he never gets defeated and you will get a good reward for your hard work. Friends, I want to make it clear to you that you want to make money by making a blog or working on YouTube does not make any difference to it The most important thing is that how good your work is to people, if you have a job, you will definitely get money and you will definitely get success and success . I will show you such a lot of people who have been working on YouTube for a long time who do not have good income and there are people who are earning millions of dollars from YouTube. work in and what makes you feel more comfortable because this is most important and this will be your CD of success. You can take advice from others, but do not take any decisions at any time when you come to talk about others because the front does not know what you can do well, therefore you have to ask this question yourself and only money It is not fair to choose between either blogging or YouTube You have a great option that you can even create blogs and work together on YouTube if you have more interest in blogging then you can pay a little less attention to YouTube and if you are on YouTube There is a lot of interest then you can pay little attention to blogging. In this way, you can work on both platforms and increase your income. But there is no doubt that YouTube's future is looking very bright because as we look at the video, we can learn anything well and not by reading the text. Since an internet connection has become cheaper since then, most people are spending too much time on YouTube, so if you have a talent inside you then you can work on YouTube and you can also create your blog together, both work together Do not make any difference. Since the connection of Geo has come to India, the number of people using YouTube using YouTube has increased a lot and at present, when people are getting 2 GB of data every day, then people are more time to learn videos by watching videos on YouTube Likes. Because reading the text sounds a bit boring and does not even come in the interest and watching a YouTube video gets a good time pass and they get a better understanding. But here neither one of them can speak good and bad for another, it is entirely up to you that you like writing or making videos on YouTube. Friends, here I will tell you that you take your decision by thinking that you can guide us, we can tell you a few things but whatever work you are interested in, you do the same thing. You must have success and success. What is Event Blogging? How to do Event Blogging? Why should you start blogging?